Over the last few years I've run into A LOT of people who are really struggling. Folks are feeling more and more worried, burdened, fearful and helpless. I can't even begin to tell you how much cancer I've seen in the last several years. It's been crazy! Add to that all of the scary things happening on the world stage, along with the moral decay spreading throughout our society, and it can all get to be a bit overwhelming at times. This is why I believe it's time to call in reinforcements. Someone to provide wisdom, guidance and intervention. In other words, it's time to call in the big guns by turning to God on a much larger scale. 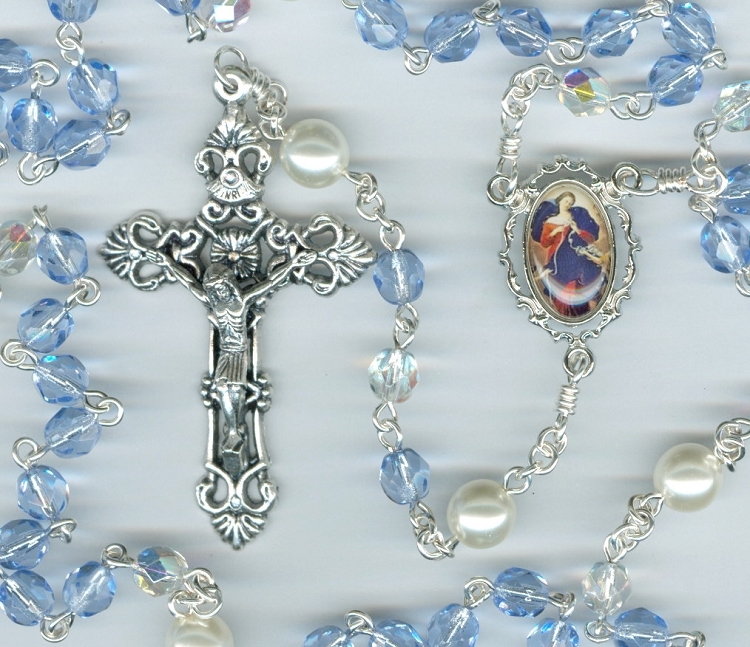 With this idea in mind, I quickly found myself inspired (and strongly driven) to create a special rosary. 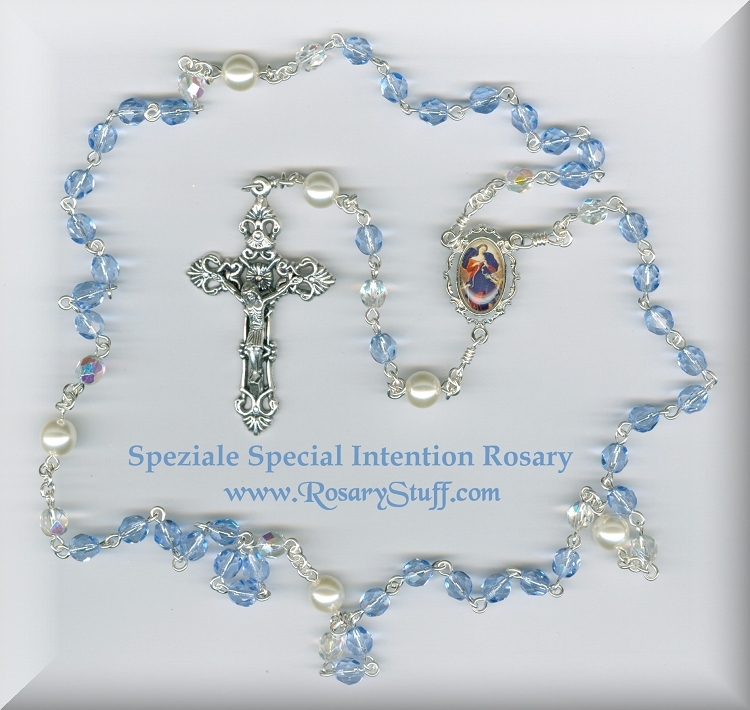 I call it The Speziale Special Intention Rosary (SSIR for short). It is a new way of helping people organize their thoughts so they can ask God for help and intervention while still meditating on the Mysteries of the rosary. Kind of like a Trapper Keeper for prayer. My hope is that it will help people process through the emotional stress and trauma of their daily lives while also giving them the ability to focus on some good stuff too. We all know that constant focus on overwhelming negativity isn't healthy for anyone, but hopefully this rosary will give people an opportunity to voice their fears, ask for help, and then recognize, and be grateful for, all of the wonderful blessings in their lives (even those we sometimes take for granted). This particular SSIR was made using beautiful light sapphire, ab clear and white pearl Czech glass beads. The photo center features Our Lady, Undoer/Untier of Knots who has recently become a popular mainstream image thanks mainly to Pope Francis. He considers it one of his favorite depictions of Mary. The original painting was created by Johann Melchior Georg Schmittdner around 1700 and hangs in the Church of St. Peter am Perlach in Augsburg, Germany. Mary is shown undoing or untying knots in a ribbon. The knots can be representative of all kinds of things from sin, world and community instability, marriage, medical, or job problems, or any personal or societal issue that seems insurmountable and beyond our reach to resolve on our own. Oh Blessed Our Lady Untier of Knots, Oh Holy Virgin, You were given the world's problems to undo, represented by knots. We pray that you help our society by restoring our world to one of Peace, Hope, Faith and Serenity. Amen. This hand made, Speziale rosary also comes with a special prayer card and a drawstring pouch for easy storage. BEADS: The Aves are mix of 6mm faceted, fire polished light sapphire blue and 6mm faceted, fire polished AB clear beads. The Paters are 8mm round snow pearls.